Akram Khan’s Giselle begins in gloom. 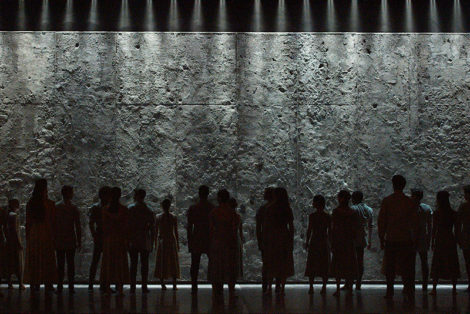 A grey wall confronts us and the figures onstage are shadowy. Greyness and gloom in fact pervade much of the production. But it is a truly fascinating work in which we are given enough clues, choreographically (a version of the famous ‘cow hop’ crossing of the stage by the Wilis appears in Act II) and musically, to remind us that we are indeed watching a version of Giselle. All the main characters are there and they have the same relationships with each other as they do in traditional productions. But they inhabit a very different world from the peasants and gentry of the Rhineland. Khan’s Giselle is set in a community of migrant workers, workers marginalised by factory landlords. Albrecht is a member of the wealthy class. Hilarion is an outcast but a ‘foxy’ person who is able to cross boundaries and broker exchanges. Giselle is a former garment factory worker exiled from her home and family. And so the story goes. Act II takes place behind the wall, in a kind of ghost factory where female factory workers have laboured and where many have died. And so the story goes. But the fascination is in the choreography as much as in the reimagining of the story and the relocation of it in a world in which globalisation and its effects are powerful forces. The factory workers dance in an orderly fashion, even in a militaristic manner somewhat like factory machines. Hilarion, wonderfully danced by Cesar Corrales, is often animal-like as he insinuates himself into the lives of others. He throws himself acrobatically around the stage. He is everywhere. 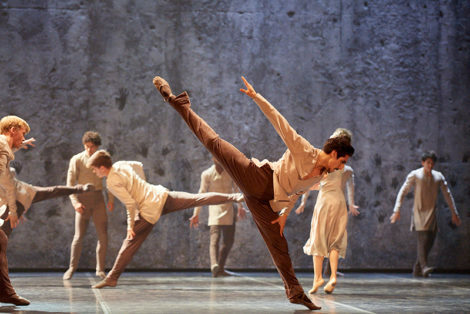 The music, by Vincenzo Lamagna after Adolphe Adam, is relentless, the dancing compulsive. When Albrecht (James Streeter) arrives on the scene the music stops and he has a solo in silence. A duet between Albrecht and Giselle (Tamara Rojo) takes place in the shadows. Then at the wailing sound of a siren (referencing the horn of Adam’s score) the wall lifts and the landlords arrive. The party includes a cold and distant Bathilde (Begoña Cao) to whom Albrecht is engaged. The landlords wear outlandish clothes and pose decoratively, or move in a highly stylised fashion. Giselle recognises the dress Bathilde is wearing. It is a dress she has sewn. Eventually Albrecht leaves with Bathilde and chaos ensues. The dancing becomes frenzied, the grey wall turns red, the music gathers in volume and then stops. Curtain. Act II is sometimes quite balletic by comparison. The Willis dance on pointe for one thing. 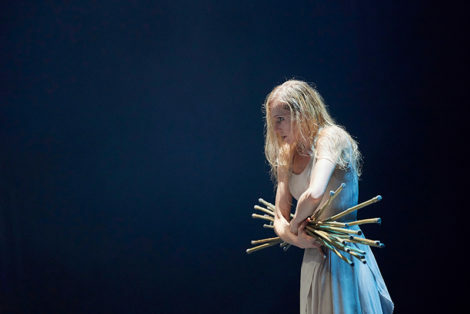 Myrtha, strongly and impressively performed by Stina Quagebeur, drags Giselle’s body centre stage and reanimates it. The Wilis wield sticks like giant needles—references perhaps to a former life the Wilis have spent in a garment factory. The Wilis are relentless in their dancing and in their torment of Hilarion. They often crouch like witches, hair streaming down. Giselle and Albrecht have a pas de deux of swirling lifts, of sweeping proportions and of reconciliation. Eventually Albrecht finds himself alone. Final curtain. There have been many different productions of Giselle over the many years I have been involved with dance. I have my favourites. But the Akram Khan version is perhaps the most startling I have seen. It has a deeply searching quality to it that questions life in our time. 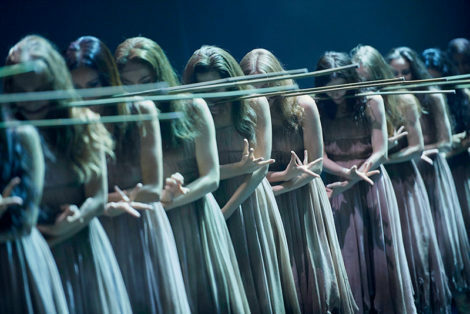 And yet it also addresses the themes of the traditional Giselle: love, life, betrayal and reconciliation. I guess, however, I would have liked the characters of Giselle and Albrecht to have been more clearly articulated in the narrative, or in the choreography. I’m not sure it was all that clear just who they were, or where they fitted into the world we were seeing. They have a very clear societal position in the traditional ballet but not so much in Khan’s. Or perhaps this is because I have seen so many traditional productions of Giselle that there is no doubt in my mind where they fit into the story? But I have nothing but praise for the dancers of English National Ballet. They performed Khan’s choreography with stunning success. A ballet to be seen again and again I think.